Say “Museum” and people imagine a dull, dusty dreary place silently enjoyed by bespectacled academics. Nothing could be further from the truth at Bailiffgate. I joined the energetic and enthusiastic group of volunteers a few years ago. My time has been nothing but a joy! The work is fascinating, providing an amazing insight into the workings of a museum. Volunteers offer a wide and diverse number of skills and interests. They harness these in inventive ways to develop the museum and all its services. I have worked in a variety of areas - Exhibitions, Education, Displays, Research, Maintenance and Customer Service. I have been encouraged to extend and develop my personal skills through sensitive and interesting training in all these areas. Seeing adults and children enjoying their visits and involvement in workshops has made me very proud of the part I have been able to play. I would recommend volunteering to anyone. Come and share the fun and friendship because volunteering will definitely enhance your life. The added bonus is you extend your knowledge of Alnwick and District and become far more aware of your heritage. If you are considering a career change or are seeking employment volunteering at Bailiffgate is especially useful. It will boost both your both your personal skills and your CV. Become a “history and heritage junky” like me. 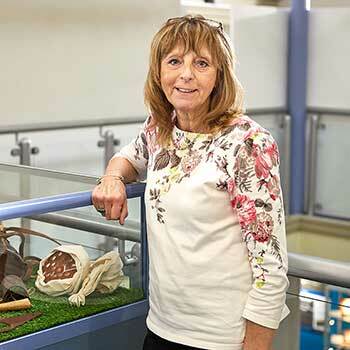 Meet the museum visitors and help to show them how great Northumberland and its people are. Contact us for more details or use the button to the right.